The House of Light is a work created by artist James Turrell for the Echigo-Tsumari Triennale and is a house where visitors can actually stay for the night while appreciating the arts. Have you heard of the Echigo-Tsumari Art Field Triennale before? Located in Tōkamachi, Niigata prefecture and taking place once every 3 years, it is the largest outdoor art festival in the world. Using the grounds of Echigo-Tsumari as their canvas, artists both domestic and international put on exhibitions and performances here. Next taking place in 2018 and 2021, this event is one that many may find hard to match their schedules to. But don't worry. A few of the exhibitions from this incredible art festival can be seen all year long. One of particular interest is the House of Light. The House of Light was installed by the light artist James Turrell (*1) for the first Echigo-Tsumari Art Field Triennale in 2000. Built in a manner that allows viewers to appreciate the effect light has on its surroundings and the changes it causes, this fantastic work enables its viewers to fully experience light with their entire body. It is said that Turrell's inspiration for this work came from Japanese novelist Tanizaki Junichirō's (*2) essay "In Praise of Shadows" (*3). And now, the House of Light can be rented as a guesthouse. *1 James Turrell: a modern artist from Los Angeles; has works in the 21st Century Museum of Contemporary Art in Kanazawa and the Chichu Art Museum in Naoshima. Works are dominated by themes of light and space. *2 Tanizaki Junichirō: a novelist working from the end of the Meiji era through to the post-war Shōwa era, highly esteemed both abroad and in Japan and considered an exemplary writer of contemporary Japanese literature. *3 "In Praise of Shadows": a work written when electric light was not yet commonplace, it discusses themes of light and shadows and their interplay, underlining the importance of shadows and twilight in traditional Japanese aesthetics. 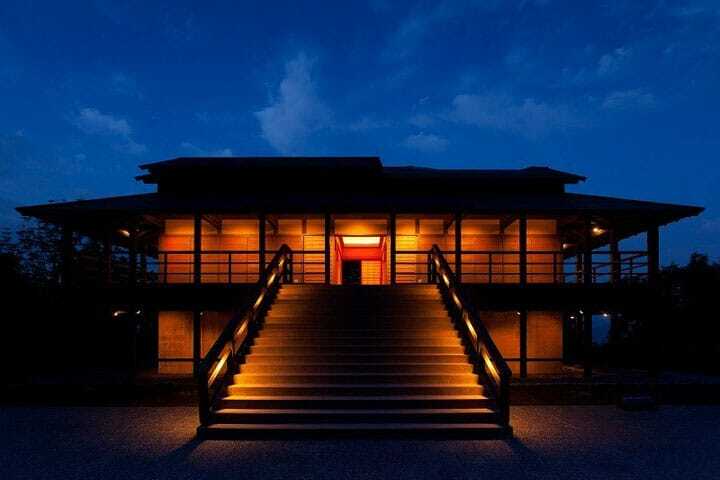 Incidentally, the architecture of the House of Light also takes some inspiration from an important cultural property of the Echigo-Tsumari area, the Hoshina House, a traditional Japanese home. Now we will take a look at some of the light works contained with the House of Light. First is "Outside In", which may be viewed by visitors or guests that stay in the house. A sliding panel in the roof opens up to reveal the subtle changes in light that take place from the midday sun to sunset in this work. By laying back and watching the square window above you, you can relish the gradual changes in the blue of the sky; your position on the floor will also change what your view is like, making this an interesting work from every angle. By all means, please enjoy the aesthetics of lying on tatami as you appreciate the changing light and sky overhead. This work can only be seen by those who stay at the House of Light. Light Bath is a work wherein fiber optics throughout the house run through the bathroom and, while you are immersed in the tub, you can appreciate the interplay of light and shadow against the water. Reservations for staying at the House of Light can be made via this form. As it is quite popular, it is better to make a reservation in advance as soon as you are certain of your travel dates. Meals from local restaurants will be arranged for guests staying in the House of Light. In situations where there are only a few people staying in the House of Light, double and even triple bookings will be made. Part of James Turrell's vision was that the House of Light would be a place where several families can stay the night and experience the changes of light together. In this remote meditation space you may find that new experiences and new encounters are waiting for you. Niigata - See World-Famous Art, Ride A Unique Bullet Train, And Relish Fine Cuisine!